Gator Ford is the nation's largest Ford RV Service Facility. We have the on-site ability to handle many issues that traditional corner garages and dealerships simply cannot. Our quick and easy drop off will get you back out and enjoying your RV without the delay from sending out for unavailable parts. Let us worry about your RV, so you won't have to! Our all-inclusive RV Maintenance and Repair Service for the Get the peace of mind knowing your maintenance is done right to avoid costly repairs down the road. Our technicians are specially trained and certified for service on Ford, ASE, Caterpillar, and Cummins engines. These certifications, special training, advanced diagnostic systems and specialized tools ensure that you're getting the absolute best service for your RV. While many people will gladly take services of these vehicles upon themselves, oftentimes they are unaware that such work will often void manufacturer-based warranties, which tend to be RV specific that can only remain intact by certified service. In addition to the risk of voiding warranties, your certified technicians can ensure you're RV is getting the correct parts and all the correct services for each mileage and usage. RV's deserve and demand a level of touch and care somewhat different than traditional vehicles. They have more onboard systems not directly related to driving which can either positively or negatively impact your experience with your vehicle. Your Gator Ford service technicians are trained to not only deal with specific engine types, but every aspect of your vehicle maintenance. They will keep it functioning not only in terms of motors and transmission, but throughout the minor nuances that keep your RV an enjoyable everyday vehicle or vacationing experience. In addition to the benefits of certified technicians working on your RV, there are a host of additional risks and concerns most people are unaware of. In terms if RV service we're talking about different engines and systems than you find on your average car or truck, because this is not a traditional vehicle. Some of these differences create inherent risk to an owner looking to maintain their RV at home. Parts, cables, hoses, and engine systems are set-up more complex than on most cars and therefore tend to be difficult to work on. Beyond this, make-shift parts like cables and hoses that might appear at a glance to fit your RV might, and more often than not, will be problematic in overall performance of your vehicle, risking RV's engine life and everyday workability. 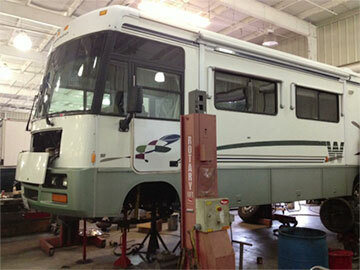 Preventative maintenance is important, especially if your RV is stored more that it is used. 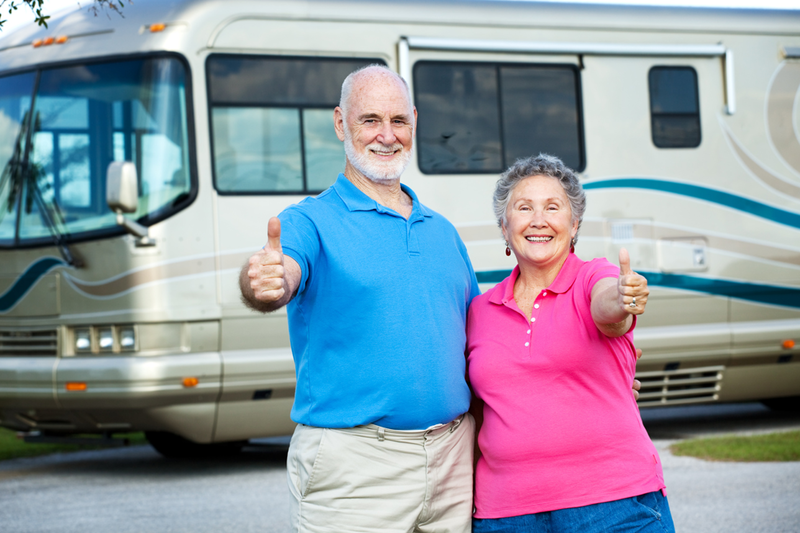 Your RV is a valuable investment and can be costly to repair if not properly maintained. These are our maintenance recommendations based on manufacturer warranty requirements. To achieve maximum performance and longer battery life – our service includes removal of house and chassis batteries, cleaning of terminals and posts, test cranking amps/volts, top-off fluid, clean battery tray, install acid neutralizer mat into battery tray, reinstall all batteries, apply anti-corrosive. Visual inspection of hoses, clamps, radiator and heater hoses – drain coolant and fill with new coolant. Prices include up to three gallons of coolant. Trailers - Removal of tires for inspection and testing brakes for proper operation and amp draw – removal of drum and hub, and inspect brake shoes for excessive wear – inspect and repack wheel bearings, as necessary – check and adjust air pressure in tires. Diesel Motorhomes - Removal of tires for inspection of brake linings, rotors and hoses – includes high pressure cleaning of brake sediment and lubrication of slack adjusters. Motorhomes - Only the front grease points are lubricated when engine oil change is performed – this leaves the drive train unattended – our service includes lubrication of steering linkage, drive shaft, u-joints, front axle kingpins and front suspension – plus, inspection, and top-off of wheel bearing and rear axle lubricants.